Rudolph “Rudl” Mergelman is a descendant of two Colorado pioneer families. He was raised in the heart of the open range of Western Colorado. Horses, cattle and working ranches were the way and love of his life. He spent his summers and weekends punchin’ cows, fixin’ fence, irrigatin’ and puttin’ up hay in the Powderhorn Valley, but never passed up a chance to help friends move cattle all over the Gunnison country. Many of his boyhood friends have taken over the family ranches and are carrying on the tradition. Family members and friends frequently appear in his paintings. 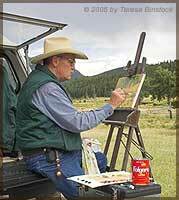 His knowledge of the cattleman is evident in the authenticity of his work. Rudl spends hours observing elk, deer and bighorn sheep in their natural surroundings. His wildlife work reflects a keen knowledge of the animal, their character and environment. His work is bold and vivid, as are the animals and countryside. Rudl’s work has been requested for many invitational shows, collected by several public collections, and has been recognized by prestigious awards. Visit Blue Heron Gallery in Florence, Colorado where Rudl has a studio and his works on on display. Rudl’s work is now also represented by and shown at The Lucille Lucas Gallery, 126 North Main Street, Gunnison, CO. You can find out more about​ Rudl Mergelman on Google.com. Rudl can be reached via email here. Please check out Rudl’s favorite artist, his daughter Audrie at amergelman.com, his favorite writer and son August at augustmergelman.weebly.com and view the woodwork of Ed Darchuk another creative and gifted member of the family at www.eddarchuk.com.